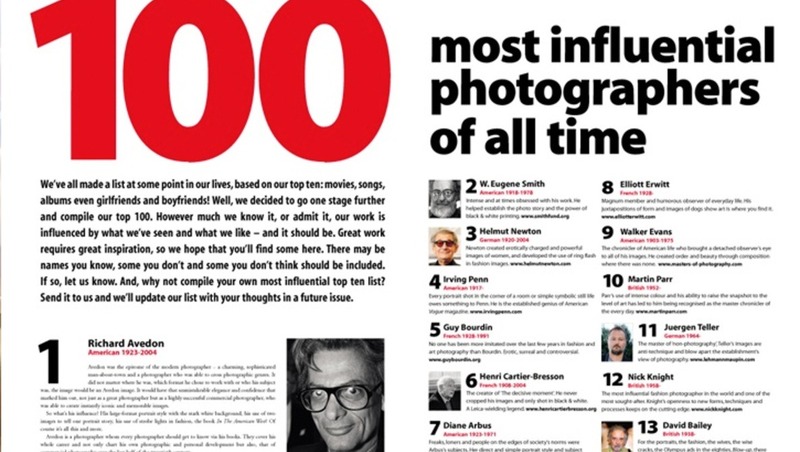 I just caught a repost A Photo Editor did on the "100 Most Influential Photographers of All Time" by Professional Photographer Magazine and had to throw it up for our readers to explore. So for all of you who think that posts like Hula Hoop Girls at Burning Man are lacking in photography fiber, I'll give you this to chew on. Thanks to Professional Photographer Magazine for putting out such nutritional content and if you like what they do you can buy their latest issue here, instead of waiting for me to find it. On a side note: I'm very curious to know how many of the photographers on this list our readers have studies or even heard of. 1 out of 100? 5? 10? 50? 100? Let us know in the comments below. The creator of ‘The decisive moment’. He never cropped his images and only shot in black & white. A Leica-wielding legend. The chronicler of American life who brought a detached observer’s eye to all of his images. He created order and beauty through composition where there was none. The master of ‘non-photography’, Teller’s images are anti-technique and blow apart the establishment’s view of photography. 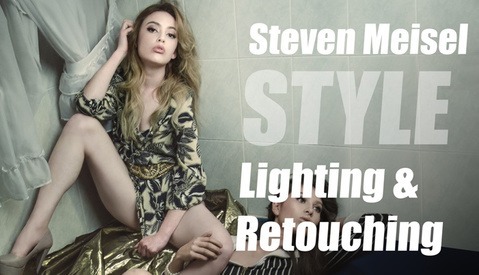 The most influential fashion photographer in the world and one of the most sought-after. Knight’s openness to new forms, techniques and processes keeps on the cutting edge. The ultimate self-portraitist, Sherman’s use of herself as the model was at the forefront of photography being recognised as art. A pioneer of street photography, Winogrand’s approach of not looking through the viewfinder became his trademark which led to his fluid and innovative compositions. Surrealist and painter. Lee Miller was his muse but it was with his darkroom experimentation that his influence was strongest, creating his ‘rayograms’ and solarized images. The prince of eighties Californian glamour and celebrity. His work inspired Madonna in her videos and filled magazines for over a decade. 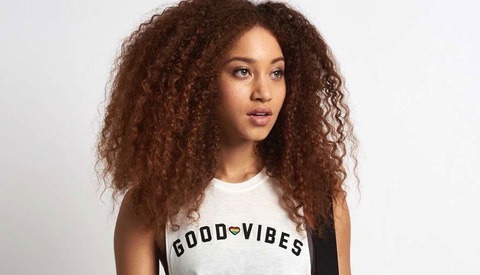 She started out as the staff photographer at Rolling Stone and is now at Vanity Fair. She’s shot everyone and her portraits define our times. The anarchic rebel of fashion, reportage and film making. His wide-angle ‘in your face approach’ lives on, as does his attitude. Kertesz brought a reflective eye to street photography and showed how portraiture can be an extension of reportage. Sander’s ambition to use photography to document not only created an incredible archive of portraiture, it also brought a scientific approach to the art of photography. He had a police radio in his car and got to crime scenes before they did, creating the archetypal image of a news photographer. Eggleston’s use of intense colour, uneasy composition and disconcerting subject matter bought him to prominence and gained acceptance for colour photography as art. Corbijn’s images of Joy Division and U2 have influenced the approach of rock photographers for over 20 years with his cross-process colours and atmospheric black & whites. Brassai’s images of Paris at night and his experimental use of location lighting defined the art of night photography. Blumenfeld’s work in fashion and beauty focused on techniques such as solarization, wet silk, and elaborately contrived shadows and angles. He was way ahead of his time. Michals use of text and collage in his images brought an intellectual dimension to his work. A photographer and communicator. Mario Testino’s images are the epitome of glamour and high fashion. He lives the life and photographs it. Every fashion photographer’s dream. Mary Ellen Mark started photographing the streets she lived in and developed into one of the world’s leading reportage photographers. Where Testino brings glamour to fashion, Demarchelier brings sophistication and understated glamour to all of his images. The French David Bailey, Sieff modelled for Avedon, shared a studio with Horvat and perfected his photographic approach with one light, a Nikon camera and a grey backdrop. One of the ‘Cockney Three’ along with Bailey and Terry Donovan. Duffy gave up photography to restore furniture but his legacy is powerful. Araki’s controversial images of bound women, flowers and food have created a worldwide following for this driven photographer. Moon’s fashion and personal images have influenced every photographer who’s seen her work and marvelled at her use of colour. One of the few female photographic pioneers, Cameron photographed her family with very little technical expertise and created soulful sepia portraits that still inspire today. The quiet newspaper photographer for The Observer who only uses one camera and takes exposure readings off the back of her hand. An inspiration and still shooting today. Toscani created the Benetton brand image and has worked to include a political message in commercial images ever since. This French duo’s work, before the advent of Photoshop, took photomontage and retouching to new levels of camp perfection. Doisneau went walking and took pictures every day of the everyday in his beloved Paris, France. The ultimate street photographer. Ray Jones is another photographer’s photographer, despite his short life and minimal output he is regularly noted as an influence by photographers in all genres. Hard drinking and living, Capa not only helped found the Magnum agency, he also captured the most moving images of World War II. No, they just think they don't need one. Yeah, I'm sure their ego dictates their website. Maybe it truly is because they don't need an amazing website when they're so well known and out there shooting. So ones ego is now judged by ones website? That makes no sense at all. None of these photographers were brought up with Internet, so they not paying much attention to it isn't anything special. All studies that shows Internet usage throughout the ages would support this claim. I didn't count, but I would say about 15 I knew. Proud Anton Corbijn is on that list. He's an amazing photographer. Off-topic: Please correct the grammar in the title by either removing the colon or the apostrophe. You're welcome and thank you for responding. No Julius Shulman? Is this some kind of joke? Where's Ken Rockwell? Just kidding folks. Seriously, no Julius Shulman or Steve McCurry? Bresson not in first place... strange. then I see Sebastião Salgado in 64th. And then Robert Capa in 95th. Is there anything wrong with these numbers??? Move 13 David Bailey up, and 22 Annie Leibovitz down. Way down. I mean Leibovitz is 22 and Ansel Adams is 23? What are they smokin' at Professional Photographer Mag? No Arnold Newman? Arnold invented an entire genre of photography, the environmental portrait. No Mark Seliger? No Gordon Parks?... What's up with this list! Yeah it's amazing to see how crappy some of these folks' websites are. I know Anton Corbijn's and Martin Parr's website are just downright ugly. And yes, the explanation for this naturally is: they don't have any need for a decent website :) Their name + constant output of appreciated work earns them enough publicity. Brassai was Hungarian, not French. He was born in Brasov (back then in Hungaria, but now in Romania). He surely deserves a better place in this top. Funniest name on the list - Angus McBean (but I'm sure he's a great photographer). No Karsh or Newman is an abomination. This list is the most influential. Those 2 created an entire genre. Only a little less upsetting is the lack of James Nachtwey on the list. I know these lists are subjective but come on now. Also, I think influence is a rather wide term. In a sense you could consider modern day commercial photographers such as David DuChemin or Chase Jarvis to be quite influential as well, albeit mostly because they influence the photographers that are just starting out and are looking to them for inspiration. How could they overlook Eiko Hosoe? How come aceclicx is not in this list?